If there was something that facilitated the writing of my book, Return to Order, it was the ability to isolate myself and work only on the book. Like everyone, I had a busy schedule that did not include writing a book. I had tried everything to get away for some weekends and write but to no avail. Alas, whenever I did study for a weekend, I would lose much of the train of thought of my studies over the course of the following week. The next time around was spent getting back up to speed. In addition, the writing skills needed exercise that an occasional flexing wasn’t going to help. And then there were the distractions we all face. The e-mails, phone calls and meetings that hasten the pace of life and made it seem like I was getting nowhere. There was no time for anything and yet I seemed to waste so much time on trivial matters. I was faced with the dilemma of finding time that I did not have and honing skills that I did not practice. Then the ideas came that resolved the problem. First, there was the problem of time. Where was I to find the time? 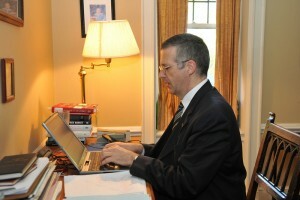 I resolved on January 1, 2008 to simply make the time by studying a little every day without fail. That meant every day even Sundays. That meant some time, even if it meant as little as 15 minutes. I would study every day with no exception. I had read that pilots on aircraft carriers need to fly every day to hone their skills if they are to keep flying since they degrade quickly. So also it is with writing. One must write or study daily, even just for 15 minutes, if one is to write a book. At least for me, stopping for even a day can cause skills to degrade and it will take much time to recover. The second problem to resolve was the place to study. I could not use my office—there were simply too many distractions. I needed to find a place to call my own—far from the maddening and virtual crowds. Since I live alone right next to my office, the obvious choice was there. The house was absolutely empty during the day. There was no one to bother me. It proved the perfect place to think and, above all, pray. Best of all, there was no internet in the whole house. There was a rarely used phone and not even air-conditioning. There was silence. And it was in that silence that the words began to flow. I still remember that first New Year’s Day when I went to my room and opened a book to start my study program. I remember the exhilarating feeling to think that I was actually studying! Although I was beside myself with joy, I do not remember what exactly I studied that day, only that I did indeed study. By the end of the day, I had logged two and a half hours of study. The next day, I found three hours to study, the day after that only an hour, yet another only a half hour. Sometimes, I would take an hour in the morning or the afternoon. At other times, I would take time throughout the day or night. Without shedding any other essential responsibilities, I managed to carve out time. By the end of the month, the tally was seventy-five hours. Thus, began the long journey of writing a book that all authors know and experience… and love. It involves the hours of writing when there are blessed times of inspiration that fill you will joy. There are other times when the mind appears to be empty and nothing seems to come out. Above all, there is the grueling daily grind of writing with or without inspiration, day in day out, hour after hour. The secret is steady development, never stopping, always studying, never losing one’s edge. Writing a book is a lonely task. However, it becomes less lonely if the author calls upon the help of God for perseverance and inspiration. Prayer is an important part of the equation since you most have recourse to it when you come to know your own limitations and the poverty of your abilities. When extraordinary inspiration suddenly comes—and something actually sounds good—it is at those times you realize this is something that is beyond your normal abilities. These are the secrets I found for writing. The rest is mere repetition. I simply followed this formula for 46 months. There is little more to report. Some 9,000 hours later, the book appeared. And so, as a Catholic author, my simple secrets to writing a book can be summarized like this: Carve out time every day to pursue your passion. Find a quiet internet-free place to write. Persevere day in, day out. And finally and most importantly, pray to God and seek the intercession of the Blessed Mother to provide the aid and inspiration to produce a work that will give Him glory. 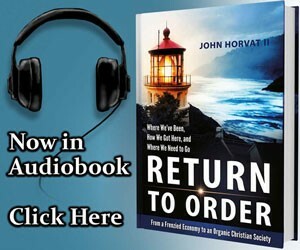 This entry was posted in Featured and tagged how to, Return to Order, writing by John Horvat II. Bookmark the permalink.